Centuries ago, if you were navigating the waters of the Pacific Northwest, you’d travel by dugout canoe. Imagine dipping your paddle into the frigid water and moving toward an island where massive conifers line the shore. The coastal air is dense with fog, so you aren’t sure where you are landing. But then you see those sculpted beacons of art–totem poles. These carved red cedar logs–more than 100 feet tall and as much as 8 feet around–are information stations. They announce what village you are entering. They also record events, personal status, and land claims. These rugged First Nations peoples have no written language, so they use art to describe their cultural identity. 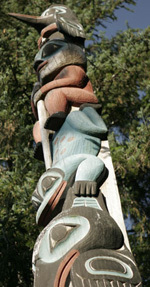 Every village carves totem poles differently and uses specific figures stacked one atop another: Some crouch or stand upright, others ride on the backs of whales; all are interlocked and connected. 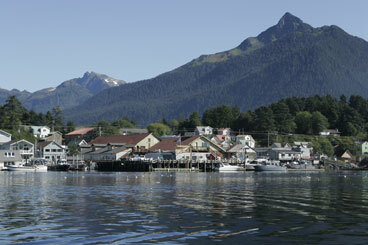 The historic town of Sitka, about 100 miles southwest of Juneau on Alaska’s Baranof Island, contains one of the world’s first totem pole parks, the Sitka National Historic Park, dedicated in 1916. Here, you can follow a deeply quiet, winding trail among enormous hemlocks and Sitka spruce, and find 14 totem poles scattered throughout the forest. At the park’s entrance stands the Southeast Alaska Indian Cultural Center, where visitors have the rare opportunity to watch and interact with modern Native artists at work. Paddling toward Sitka, the Alaskan coastal city where Tommy Joseph carves his totem poles. Tommy Josephs has been carving wood since he was eight years old. Carving the memorial pole for victims of domestic violence. Some of the large conifers that make the raw material for totem poles. Some of Josephs’ adzes, with handles made from natural tree trunks. Painting a totem pole is easier today than in times past. In the wood studio is totem pole carver Tommy Josephs, a highly gifted artist who is emerging into the art world with as much vitality as the figures on the poles he carves. 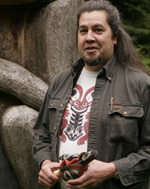 Tommy is a middle-aged, strong, barrel-chested Native Tlingit with waist-length dark hair. He cuts it periodically to use in his carved wooden masks and to adorn the ten-foot-long tribal dance staffs that he makes for dance groups. 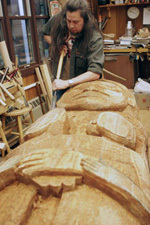 Tommy has been carving for 35 years, since he was eight years old and stealing his mother’s kitchen knives to practice. “It was hard to carve a totem pole with a steak knife. It wasn’t happening,” he laughs. Today, the town of Sitka alone has 11 of his standing totem poles. Others are in Washington, Chicago, Ohio, Pennsylvania–even Germany. When I visited, Tommy was working on a special Sitka community pole for the local Family Justice Center. It is a memorial pole for past, present, and future victims of domestic violence and their children. Since all totem poles tell stories, the grade school children were asked to come up with stories, poems, drawings, and designs explaining what peace meant to them. From that, Tommy incorporated the symbols of a dove, a rainbow, a fawn, a mother embracing her children into the totem pole. Acquiring a tree for a totem pole is no easy task. Tommy travels to Prince of Wales Island, the next large island south of Baranof, looking for suitable red cedar. He drives the logging roads and walks the forest looking for a tree with the ideal height, straightness, diameter, and lack of lower branches that would create knots. He can get three to four totem-pole lengths from a 120-foot-tall tree. He then obtains Forest Service permission and hires a logger to cut it. The tree is shipped to Sitka on a barge and hauled by trailer to his workplace. Finally, often alone, he maneuvers the two- to three-ton log with ropes and jacks to finagle it into place. “Every person that handles the log jacks the price higher,” Tommy explains. 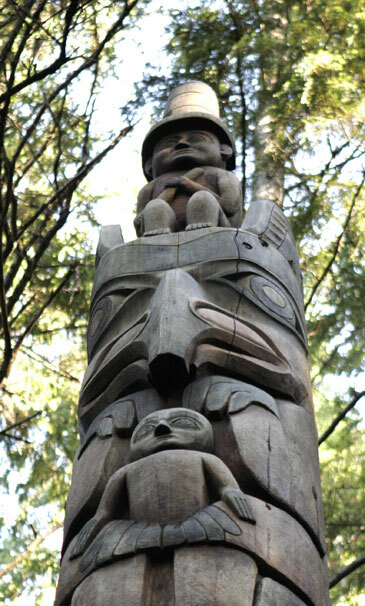 Totem pole carvers of Tommy’s caliber typically receive about $1,500 to $2,000 a foot, or as much as $60,000 for a pole. But it can take six months to a year to carve and raise a pole. No one knows for certain when the first totem poles were carved, but legend has it one washed ashore on Canada’s Queen Charlotte Islands from the South Pacific, some 2,000 miles away. The Pacific Northwest natives carved totem poles long before the Europeans arrived, but the poles that survive are only a few hundred years old, having escaped natural decay and human destruction. The moist climate breeds moss, seedlings sprout on the figures, and birds build nests in the large fissures. Missionaries burned them, thinking they were symbols of idolatry. But once the native people began acquiring iron (often from shipwrecks) in the 1780s and fashioning metal tools, the art of totem-pole carving took off. Today, the transformation from log to totem pole begins with a chainsaw. 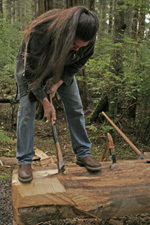 Tommy uses one mainly to mill the log and hollow out its center. The hollowing not only makes the pole lighter, it also removes the part that would rot first and helps prevent checking as the wood dries. Tommy begins the design on paper, then transfers it onto the log. He renders the first half of the drawing freehand, starting at the base and spacing the figures accordingly. Then he uses calipers and a sometimes a template to create the same image on the log’s opposite side, using a series of dots and points. It takes many years of practice to get the figures on a totem pole to flow effortlessly from one image to another. Some carvers never seem to create fluidness in their work. But all the figures and the pole as a whole should be pleasing to the eye and connect in a marvelous way. When Tommy looks at a chunk of wood, he can peer into it and tell if the image is in there or not. He can find it if it is in there. Tommy works with a combination of new Swiss-made gouges and handmade tools. He collects antique tools and forges his own from scrounged car springs and saw blades. 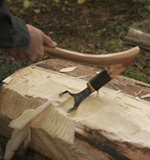 Adzes with a handle made from a natural tree trunk and branch angle are still used today, as they were centuries ago. 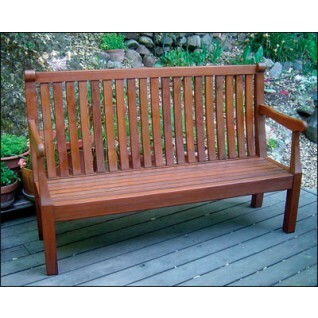 Tommy has a few woodcutters who watch for the right type of branches and deliver them for his students’ handles. Tommy likes to find his own. 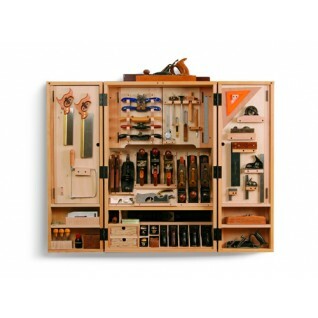 Tommy uses only five tools to gouge and remove the wood, to pull the image out, and finish it to glass smoothness: two adzes (a lip azde or a ship adze is his workhorse), and three knives, some which he uses as scrapers. Most modern totem poles are partially painted with a minimum of colors. Years ago, carvers used dried salmon eggs that contained high levels of oil, plus copper sulfite, iron oxide, graphite, and charcoal, mixing those pigments with urine–after they chewed the dried salmon eggs and spat them out to extract the oil. Tommy uses ordinary latex house paint. To seal and protect the poles, he brushes on a heavy coat of paraffin oil. The carved log will then be fastened onto a solid support of yellow cedar, which is buried as much as seven feet in the ground, depending on the height of the pole. The yellow cedar will last for 75 to 100 years. Although certain elements of design help guide the carver, there’s still plenty of room for the craft to evolve. For example, Tommy incorporated the traditional and the modern in an interior pole he designed for the local native Shee Atika Corporation. The traditional eagle and raven stand at the bottom holding up the figures, but above them is a copper shield (from shingles that blew off the nearby Russian Orthodox Church). In the wooden wing of a bird, Tommy embedded glass beads in an Athabasken flower design. Another wing has an embedded whale rib that Tommy found on the beach . An Aleut hunting visor has sea lion whiskers decorated with glass beads. On the very top of the pole, perches a young boy and girl, symbolizing the future, with shining eyes of abalone shells and real mother of pearl buttons on their robes. The shoreline plank homes and lines of totem poles crowding the coast may be a part of the past, but the art still lives on in carvers like Tommy Josephs. Throughout the Pacific Northwest, dozens of totem pole carvers are bringing them back. Carving totem poles is a way of saying, We are still here. My people are still here and we are strong.